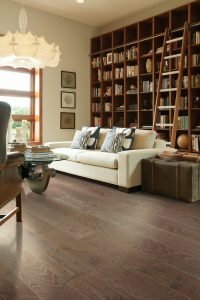 So, You’re Looking For New Flooring? When customers come to ACo in search of new flooring options, the first thing the design team does is pose several lifestyle questions to help guide the selection process. They learn which room needs new flooring, the planned use for the space, who will be using it and whether or not kids or pets fit into the equation. “From there, we start going down a path of what will work best for the customer,” says David Decker, owner of ACo in Carmel. Two-toned cut pile: Soft and dense, ideal for families with little ones who play a great deal on the floor. Nylon loop: Durable but can snag, so not the best choice for families with pets. Low cut pile and loop: Come in multiple patterns and wears well, so a smart choice for high-traffic areas. Multi-tone patterns: Come in bold, vibrant selections that transform floors into lovely works of art. Flooring selections these days are not what they were, even just a few years ago. For instance, a hugely popular choice that has only been on the market for about a year is waterproof carpet. Liquid will never penetrate the carpet backing. This means spills and liquids will not get trapped and absorbed into your carpet pad. Hardwood flooring is gaining popularity due to expanded aesthetic choices, product enhancements and longevity. Plus, hardwoods have a warm, elegant feel. You really can’t go wrong with installing hardwood flooring in your home. Customers who love the look of hardwood flooring but would prefer something that costs less, is more resilient, and holds up well to pets, often choose Wood Plastic Composite (WPC) flooring. Perfectly suited for kitchens, dining rooms, bathrooms and bars, WPC flooring is easier to install, less susceptible to dents and scratches, and less likely to expand and contract due to changes in humidity. There are also 100% waterproof versions that make cleanup a breeze and prevent water damage to your subfloor. Decker suggests that anyone who is looking for new flooring should consult with a flooring professional. For more designs and ideas visit their showroom in Carmel, or to set up an appointment with one of ACo‘s knowledgeable designers, visit liveaco.com or call them today at 317-575-9540.